Burma, as it was called for many years, became a British colony as a result of a series of colonial campaigns between 1826 and 1886. Governed until 1937 as a part of the British Empire of India, the country became independent in 1948. A military junta took control in 1988 and changed the country's name to Myanmar. Civil unrest and international sanctions have made the nation unattractive or dangerous for foreign tourists; as a result we know little of the fate of the magnificent lighthouses built in British Burma. (It doesn't help that none of the historic lighthouses are accessible without boat transportation.) Current information and photos are badly needed. 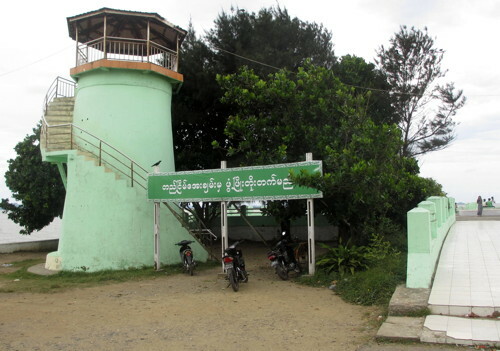 The Burmese word for a lighthouse is meepyatite (မီးပြတိုက်). An island is kyun. Aids to navigation in Myanmar are maintained by the Myanmar Port Authority (MPA), an agency of the Ministry of Transport. ARLHS numbers are from the ARLHS World List of Lights. Admiralty numbers are from volume F of the Admiralty List of Lights & Fog Signals. U.S. NGA List numbers are from Publication 112. Photos taken in January 2011 and November 2014 by Andreas Köhler. Photos by various photographers available from Lightphotos.net. Historic postcard views posted by Michel Forand. Historic postcard views posted by Klaus Huelse. 1867. Active (? ); focal plane 59 m (194 ft); four white flashes every 25 s. 27 m (92 ft) cast iron tower with lantern and gallery, painted with red and white horizontal bands. Two 1-story brick keeper's houses and other light station buildings. No photo available but Huelse has a historic photo; Google previously had the fine satellite view seen in part at right and it now has a more recent satellite view. There is no sign that the station is occupied. The Coco Islands are an extension northward of the Andaman Islands, which are administered by India; British colonial authorities transferred them to Burma in 1882. In 1953 India sought to lease the light station in order to better protect shipping in the Bay of Bengal but Burma rejected this proposal. The islands are uninhabited but the Burmese Navy maintains a small base on Great Coco Island. According to various sources China has leased facilities on the islands, but the government of Myanmar denies this and there is no credible evidence of significant military activity in the islands. More recently the government has announced interest in developing tourism in the islands, which are an important nesting site for marine turtles. The islands are attached administratively to the Yangon Region. Located on Table Island, the northernmost of the islands, about 3 km (2 mi) north of Great Coco Island and 250 km (150 mi) south southwest of the Irrawaddy Delta on the mainland. Accessible only by boat. Site status unknown but almost certainly closed to casual visitors. ARLHS MYA-018; Admiralty F1200; NGA 26564. Date unknown (station established 1893). Active; focal plane 16 m (52 ft); white flash every 5 s. 16 m (52 ft) square skeletal tower. No photo available, but Bing has a satellite view. This light marks the northern entrance to the Pak Chan estuary, which forms the border between Thailand and Myanmar. Note: NGA misspells the name as Pulau Palin. Located at the southeastern tip of Myin Sei Kyun (Pulau Perlin), an island about 10 km (6 mi) west of Kawthaung, the southernmost town in Myanmar. Accessible only by boat. Site status unknown. Admiralty F1158; NGA 26570. Date unknown. Active; focal plane 15 m (49 ft); quick-flashing white light. 19 m (62 ft) square wood (?) skeletal tower rising from a 1-story wood equipment shelter. Lighthouse painted white. No photo available but Google has a satellite view. Myeik (formerly Mergui) is the largest port in southern Myanmar; it was formerly a Thai outpost but it was conquered by Burmese in 1765 and the British annexed it to Burma in 1826. Located at the water's edge on the Myeik waterfront. Site open, tower closed. Admiralty F1144; NGA 26576. Date unknown. Active; focal plane 12.5 m (41 ft); white flash every 3 s. 12.5 m (41 ft) square cylindrical skeletal tower, painted with red and yellow horizontal bands. No photo available but Bing has a satellite view. Located off a swampy point at the entrance to Myeik, about 10 km (6 mi) north of city's waterfront. Accessible only by boat. Site open, tower closed. Admiralty F1138; NGA 26572. Date unknown. Active; focal plane 6 m (20 ft); white flash every 5 s. 4 m (13 ft) square skeletal tower painted in a black and white checkered pattern. No photo available but Google has a satellite view. Mali Kyun (Tavoy Island) is a long island at the northern end of the Mergui Archipelago. Located at the easternmost point of the island. Accessible only by boat. Site status unknown. Admiralty F1136; NGA 26580. 1883. Active; focal plane 94 m (308 ft); white flash every 5 s. 9 m (30 ft) square masonry tower with a "round lantern," according to NGA. Lighthouse painted white. Sangamithra Iyer's photo is at right and Google has a satellite view. Located in southern Myanmar on the west side of the entrance to the Tavoy estuary. Accessible only by boat. Site status unknown. ARLHS MYA-009; Admiralty F1132; NGA 26584. Date unknown. Active; focal plane 53 m (174 ft); white flash every 7 s. 4 m (13 ft) "black and white checkered framework tower," according to the NGA List. No photo available; Google's satellite view appears to show a small square pyramidal tower. Located on a tiny island off the southern end of Auk Bok, the southermost of the Moscos Islands. Accessible only by boat. Site status unknown. Admiralty F1131; NGA 26588. 1865. Active; focal plane 43 m (141 ft); white flash every 15 s. 20 m (66 ft) brick tower with lantern and gallery, mounted on a granite base. Lighthouse painted white. No current photo available but Huelse has a historic photo and Google has a satellite view. The British engineers shipped brick from Singapore for this lighthouse, which guides ships toward the Moulmein River entrance to the north. Located on a small island about 11 km (7 mi) offshore and about 25 km (15 mi) south of Kyaikkami, on the approach to the Irrawaddy from the south. Accessible only by boat. Site status unknown. ARLHS MYA-004; Admiralty F1128; NGA 26592. 1903. Active; focal plane 41 m (135 ft); two white flashes every 10 s. 20 m (66 ft) masonry tower, painted with red and white horizontal bands. 1-story keeper's house and other light station buildings. A photo by Köhler is at the top of this page, Huelse has a historic photo, and Google has a satellite view. Köhler visited the station in January 2011 and found it in good condition and staffed by a team of keepers. 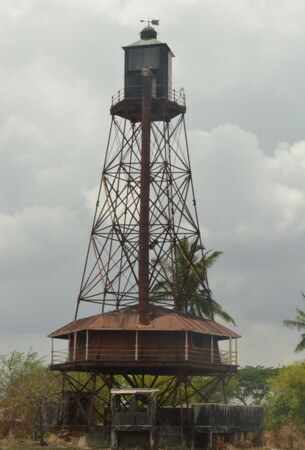 The lighthouse marks the entrance to the Moulmein River from the Gulf of Martaban. Located on a small island close to shore at Kyaikkami, a temple and resort town known as Amherst during the colonial period. Accessible only by boat. Site open, tower open by arrangement with the keepers. ARLHS MYA-006; Admiralty F1126; NGA 26596. 1869. Active (? ); focal plane 28 m (92 ft); white light, 4 s on, 2 s off. 32 m (105 ft) cast iron skeletal tower with lantern and gallery, mounted on a screwpile foundation; a 1-story keeper's house is included in the lower portion of the tower. The lighthouse was originally painted red and the lantern black and white. Cara Gilbert's photo is at right. It seems unlikely that this lighthouse is maintained and it appears abandoned in Gilbert's photo. However, Google's satellite view appears to show a new light: a cylindrical white tower. This tower is not seen in Bing's satellite view so it may have been built recently. Located on the east side of the entrance to the Yangon River estuary leading to Yangon (Rangoon), the capital of the country. Accessible by 4WD during the dry season. Site open, tower closed. ARLHS MYA-005; Admiralty F1088; NGA 26620. Date unknown. Inactive. 16 m (53 ft) square skeletal tower with gallery. No photo available but Bing has a satellite view. This light was the rear light for both and upstream and a downstream range on the Yangon River. Located in the Thilawa oil terminal on the east side of the estuary about 20 km (13 mi) south of Yangon city. Site status unknown. ex-Admiralty F1101; NGA 26644. Date unknown. Active; focal plane about 20 m (66 ft); light characteristic unknown. Approx. 18 m (59 ft) mast with gallery. No photo available but Google has a satellite view. This range guides vessels approaching the Yangon docks. Located on a marshy point on the east side of the estuary opposite the city. Accessible by road. Site probably open, tower closed. Admiralty F1104.52. Date unknown. Active; focal plane 9 m (30 ft); continuous white, red or green light depending on direction. 9 m (30 ft) round white metal tower. No photo available and the light is not seen in Bing's satellite view of the point. Located on the point marking the north side of the entrance to the Yangon harbor area. Site status unknown. Admiralty F1105. There is a photo of two lightfloats, taken in November 2010 (2/3 the way down a long page of photos); one of these vessels is marked for the Thuriya station (ARLHS MYA-020) southwest of Alguada Reef and the other is marked for the Dagon station (ARLHS MYA-003) on the approaches to Yangon. Lightphotos.net has Jaap Termes's historic photo of two other lightships, identified as the Krishna and the Baragua. Information on all these vessels is needed. Date unknown. Active; focal plane about 8 m (26 ft); white flash every 5 s. 4 m (13 ft) mast on a round concrete tower, painted with red and white horizontal bands. 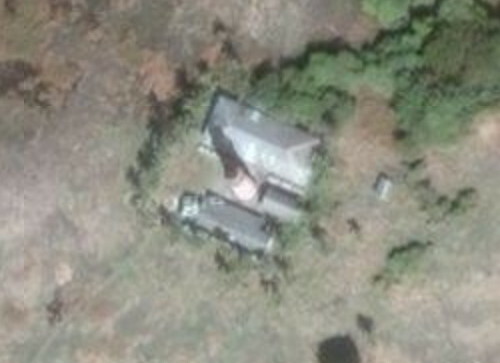 Lightphotos.net has a photo, Panchan Kyaik has a view, and Google has a satellite view. Located at the end of breakwater across the river from downtown Yangon. Site status unknown. Admiralty F1105.5. Date unknown. Inactive since 2017. 14.5 m (47 ft) square skeletal tower painted white. No photo available; the tower is probably centered in Google's distant satellite view. This range guides southbound vessels departing Yangon. Located in a village on the west side of the estuary about 16 km (10 mi) south of Yangon city. Site status unknown. ex-Admiralty F1106.1; NGA 26664. 1865. 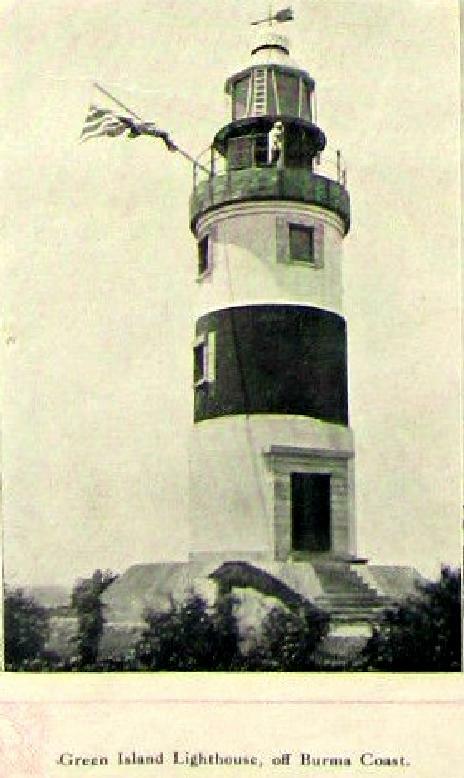 Active; focal plane 44 m (144 ft); white flash every 10 s. 49 m (161 ft) tapered granite tower with lantern and gallery, painted with black and white horizontal bands. Keeper's house and other station buildings connected to the lighthouse by a raised walkway. No current photo available, but Huelse has a historic photo (seen at right), Michel Forand has posted an 1865 drawing of the lighthouse, and Bing has a good satellite view. Surely one of the most impressive lighthouses ever built in Britain's empire, this tower was based on Alan Stevenson's design for the Skerryvore lighthouse in Scotland. It took six years to build, since construction was only possible during the winter monsoon. The lighthouse was strafed by U.S. aircraft in March 1943. Located at the end of a long reef in the Bay of Bengal extending from Cape Negrais, the southwestern tip of Myanmar. Accessible only by boat. Site and tower closed. ARLHS MYA-001; Admiralty F1068; NGA 26688. Date unknown (station established 1913). Active; focal plane 24 m (79 ft); white flash every 4 s. 12 m (39 ft) skeletal tower, painted with red and white horizontal bands. No photo available; Google's satellite view probably shows the tower. Diamond Island is famous as a nesting place for green and loggerhead turtles. Located on an island off Cape Negrais, marking the entrance to the Bassein River. Accessible only by boat. Site and tower closed. Admiralty F1070; NGA 26692. Date unknown. Active; focal plane 66 m (217 ft); white flash every 15 s. Skeletal tower, painted with black and white horizontal bands. No photo available; Bing's satellite view may show the station. NGA misspells the name as Gorangyi Kyun. Located on Goyangyi Kyun, a steep ridge connected to the mainland by a narrow isthmus, about 65 km (40 mi) north of Cape Negrais. Site status unknown. Admiralty F1067; NGA 26704. Date unknown. Active; focal plane 169 m (554 ft); quick-flashing white light. Described as a 3 m (10 ft) black and white checkered tower. It seems almost certain that this tower is actually mounted atop a building. No photo available but Bing has a satellite view of a station, the only structures seen on the island. Nantha Kyun is a mud volcano centered on a small island about 30 km (19 mi) off the south coast of Rakhine state. Located near the summit of the island. Site status unknown. Admiralty F1066; NGA 26712. Date unknown. Active; focal plane 41 m (131 ft); white flash every 8 s. 11 m (36 ft) square tower, painted with black and white horizontal bands. No photo available but Bing has a satellite view. Located on a promontory at Gyeiktaw. Site status unknown. Admiralty F1065; NGA 26708. Date unknown. Replaced. This was a 9 m (30 ft) white skeletal tower. No photo available but Bing has a satellite view. The light is not seen in Google's satellite view; it has been replaced by a pair of range lights (next entry). Located at the south side of the entrance to Ohnchaung, a settlement on the east side of Munaung Island. Accessible only by boat. Site open, tower closed. ex-Admiralty F1064.3; NGA 26720. Date unknown (recent). Active; focal plane about 10 m (33 ft), light characteristic unknown. Approx. 9 m (30 ft) white skeletal tower. No photo available but Google has a satellite view. The front light is on a similar but shorter tower about 150 m (500 ft) to the east. Located at the north side of the entrance to Ohnchaung. Site open, tower closed. Admiralty F1064.21. 1909. Active; focal plane 37 m (121 ft); white flash every 5 s. 36 m (118 ft) round cast iron tower with lantern and gallery. The lower half of the lighthouse is painted red and the upper half white. An MPA photo is at right and Bing has a satellite view. Located on a small island about 8 km (5 mi) northwest of the northwestern point of Cheduba Island and roughly 150 km (90 mi) south of Sittwe. Accessible only by boat. Site status unknown. ARLHS MYA-010; Admiralty F1064; NGA 26724. Date unknown. Active; focal plane 16.5 m (54 ft); white flash every 8 s. 14 m (46 ft) square skeletal tower, painted with black and white horizontal bands. No photo available but Google has a fuzzy satellite view. Located on an isolated rock off Kyaukpyu, about 80 km (50 mi) southeast of Sittwe. Accessible only by boat. Site and tower closed. Admiralty F1061; NGA 26728. Date unknown. Active; focal plane 33 m (108 ft); white flash every 5 s. 12 m (39 ft) square skeletal tower, painted red with a "white top." No photo available but Google has a distant satellite view. Located on the west side of the island, opposite the waterfront of Kyaukpyu, a district capital south of Sittwe. Accessible only by boat. Site and tower closed. Admiralty F1062; NGA 26732. 1891 (station established 1844). Inactive, apparently since the 1980s. 21 m (69 ft) round stone tower; lantern removed. Chandrasekhar Chatterjee has a 2017 photo, a 2009 photo is available, Köhler has a photo, Christoph Ulleweit has a fuzzy view from the sea, Huelse has a historic postcard view, and Google has a satellite view. 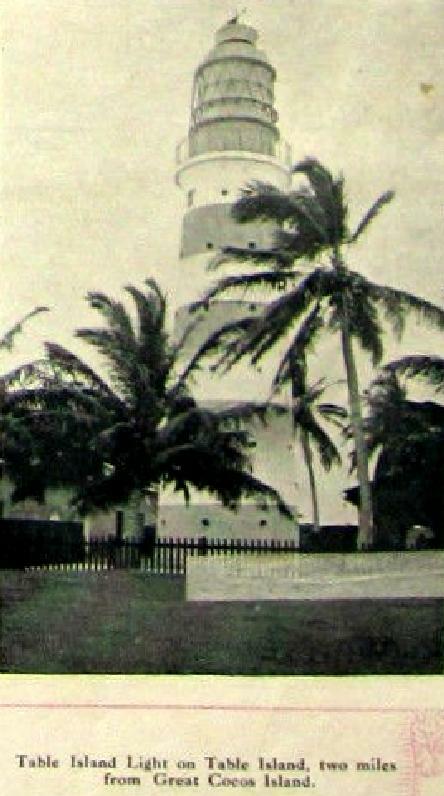 Forand has a historic postcard view of Myanmar's first lighthouse (called Fakir Point), built here in 1844 by Lieutenant Siddons of the Royal Engineers. The abandoned lighthouse is clearly endangered. 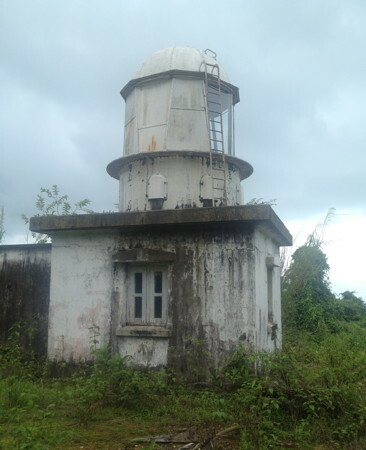 The lighthouse was probably deactivated in favor of the Sittwe light (next listing). Located on a small island off the south side of the entrance to Sittwe (formerly Aracan). Accessible only by boat. Site status unknown. ARLHS MYA-022; ex-Admiralty F1060. Date unknown. Inactive. Approx. 7 m (23 ft) round concrete tower, originally painted with narrow black and white horizontal bands, then painted a pale green as seen in Köhler's 2014 photo at right, but then painted white with a blue spiral band and blue trim as seen in Emika Young's 2016 street view. A stairway winds around the tower, and the lantern has been replaced by a covered observation deck. 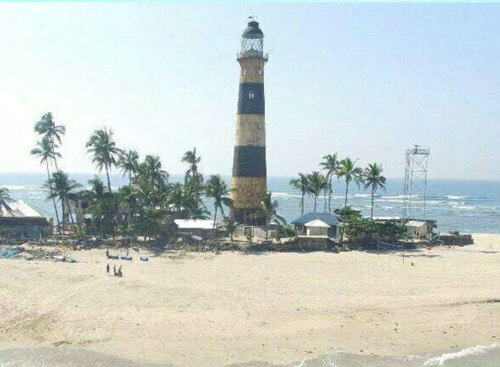 Lightphotos.net has a photo very similar to Köhler's, Myozin Oo has a photo of both Sittwe lighthouses, Huelse has a historic postcard view, and Google has a satellite view. 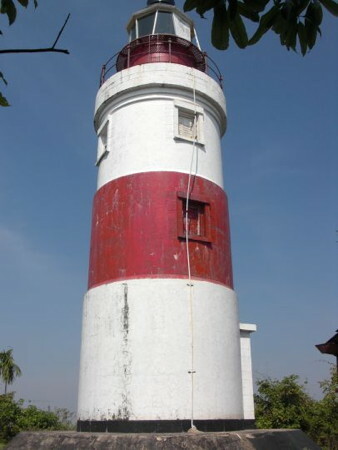 The lighthouse is located in a popular public park known as Sittwe Viewpoint. Located about 80 m (260 ft) north of the active light (next entry). Site open, and visitors can climb the stairway to the gallery. Date unknown. Active; focal plane 27 m (89 ft); white flash every 10 s. 27 m (89 ft) square pyramidal skeletal tower with gallery and a small lantern, painted white. Köhler has a 2014 photo, Lightphotos.net has a fine closeup photo, Emika Young has a 2016 street view, Myozin Oo has a 2015 photo of both lighthouses in which the old lighthouse is painted white, Forand has a historic postcard view of both lighthouses, and Google has a satellite view. Located on a sharp point on the north side of the entrance to Sittwe. Site status unknown. ARLHS MYA-017; Admiralty F1059; NGA 26744. 1892 (station established 1885). Active; focal plane 40 m (131 ft); white or red light, depending on direction, 10 s on, 5 s off. 43 m (141 ft) round cast iron tower with lantern and gallery (originally, at least). 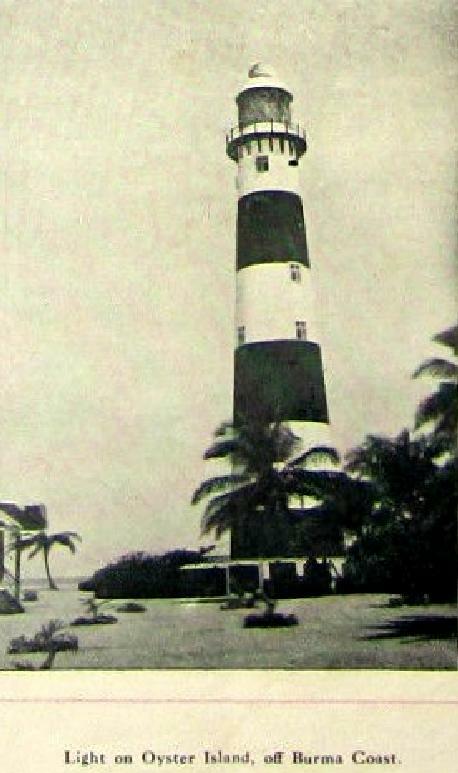 Lighthouse painted with blue and white horizontal bands. A photo is at right, Huelse has a historic photo and Bing has a satellite view of the station. 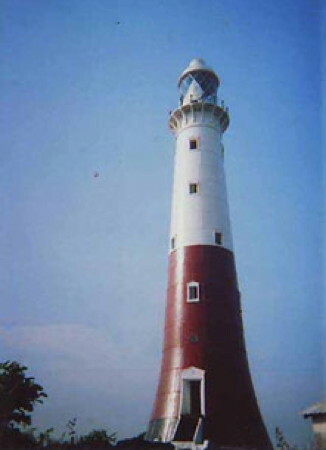 The lighthouse was repaired after being damaged by Cyclone Mala in 2006. It is endangered by rising sea level and in 2018 MPA announced plans to protect it with a seawall. The Burmese Navy staffed this station until 2009. Located about 25 km (15 mi) southwest of Magyichaung in westernmost Myanmar. Accessible only by boat. Site and tower closed. ARLHS MYA-012; Admiralty F1058; NGA 26748. China Bakir (1869-1920s), off the Irrawaddy Delta. This screwpile lighthouse was rebuilt in 1901. It was still in service in 1920 but was replaced soon thereafter by a lightship. Ruins were visible for many years. Krishna Shoal (1869-1877), off the Irrawaddy Delta. This screwpile lighthouse was destroyed, probably by a tropical cyclone. The lighthouse was replaced by the lightship Krishna; Jaap Termes has a historic photo of a more recent lightship at the station. Currently the Sanda lightship station is near this location. Admiralty F1074; NGA 26680. Oyster Reef (1876-1884). Destroyed by a tropical cyclone, this screwpile light was replaced by the Oyster Island lighthouse. Posted February 20, 2006. Checked and revised March 31, 2019. Lighthouses: 30; lightships: 2. Site copyright 2019 Russ Rowlett and the University of North Carolina at Chapel Hill.